Eat-in kitchens are one of today’s most popular design elements, but we don’t all have room for a giant island with bar seating. 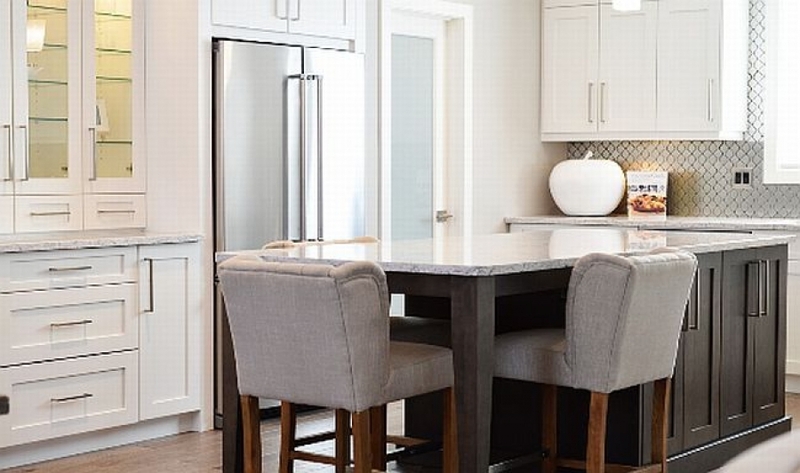 You can still create an ideal dining space, even if your kitchen is on the small size – and without massive renovation. Here’s how. If you have an unused a corner in your kitchen, you potentially have the perfect spot for a banquette. Relocate the dog bowls and buy a bench and a small table, and you have a charming eat-in area perfect for family meals. “Sometimes you can fit a banquette into your kitchen by adding it to an unused wall,” said HGTV. A “small, floating banquette adds extra seating and creates an additional spot for kids to do their homework or enjoy an afternoon snack.” You can also give this a built-in look by using the same finish as your cabinetry and framing it in cabinet panels. Building your own banquette is easier than you think. Start with a bank of lower cabinets from IKEA and customize with the cushioned top and pillows of your choosing. Check out this tutorial for inspiration. You can get a similar effect from a couple of entry benches butted up against each other; You can find many at Target, and some might already be cushioned. Just make sure the height is right so your knees don’t hit the table or you feel like you’re in a ditch when you’re eating. If you have enough space for an eat-in area at the edge of your island but don’t have a countertop overhang for chairs, you can still create an eating space. One option is to see if you can add to your countertop. If you have a material like quartz, a good installer should be able to add a piece and make it look seamless. Or, simply move your table directly up to the edge of the counter. Numerous options for counter-height tables are available, with the added benefit that being up higher means dogs have less opportunity to table surf. If you can spare a cabinet, you can create a place to pull up a couple of chairs for a casual eating space. This easy job is also super inexpensive since the countertop is already in place. This can also be a great answer for those who have a peninsula but no countertop overhang because you can create eating space on either side—and at the corner, if need be.